Do you have too much stuff in your life? We are constantly amazed by the deluge of stuff in an American life, even when we try to control it and reduce. I know I’ve often wondered how we got here. That’s part of why I love The Story of Stuff . If you haven’t seen it before, I urge you to stop what you’re doing and watch it right now (it’s about 20 minutes long). Seriously! Since it was first posted online in 2007, more than 15 million people have watched this wonderful little video by Annie Leonard and Free Range Studios, but I expect that a significant portion of those people have no idea that Annie and crew have produced seven more short films in the same style since then. The original film is a terrific, child-friendly introduction to “the way we make, use and throw away stuff.” With simple yet engaging animation, it introduces a number of ideas that children and many adults may not have thought about and connects the dots from planned obsolescence to our disposable culture. One of its greatest virtues is that, far from blaming or shaming, this story may stir outrage but it spins it toward empowerment and action. What can each of us do to reduce our consumption and our part in this cycle of consumption? As a parent, I especially enjoyed seeing my kids get the concepts quickly. It is a great learning tool and one worth repeating every now and then when the cultural tide of material consumption pulls on them. Since the original, Annie and her team have produced pointed explorations of the life cycle of specific product industries (electronics, cosmetics, and bottled water), all in the same no-nonsense, fun, and down-to-earth style as the original. Perhaps even more interesting, though, is that, recognizing that individual action is not enough by itself to make lasting change, they have begun exploring education for collective change. With The Story of Citizens United vs. the FEC, the team explains in layman’s terms what this case means and why it is significant. Yes, it is outrageous that the U.S. Supreme Court recognizes corporations as people and grants them the same rights to free speech as individual citizens. Now what can we do about it? In The Story of Broke, the team skewers the explanation that many politicians give for why the U.S. government can’t afford new programs or even to maintain old ones. They explain that the government is only broke because it first provides huge funding to corporations and their interests. Many of us suspect this already, but the way it is done is so subtle and obfuscated that we the public are kept blissfully ignorant, even as the economy tanks around us and we wonder why corporate profits keep rising even as individual bottom lines plummet. Most recently, in The Story of Change, they approach collective change head-on, advocating for a grass-roots call for a Constitutional amendment overturning the Citizens United decision and clarifying that corporations are not individuals. 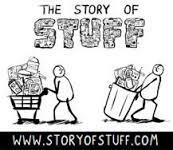 In addition to being a great educational tool advocating for individual change and individual action, the Story of Stuff is also a great resource for being part of the urgent need for collective change and true reform — both for the environment and for social justice (and seeing how closely intertwined those issues are). Go Annie! Categories: Sustainability | Tags: Annie Leonard, Citizens United vs. the FEC, empowerment, recycle, reuse, social changem reduce, social justice, Story of Stuff, stuff, Sustainability | Permalink.